A collared golf shirt and dress pants are appropriate golf attire. 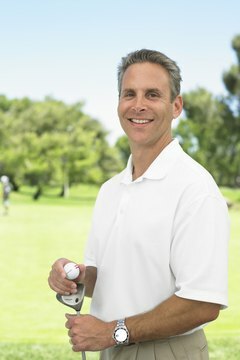 Although every golf course has a unique dress code for its players, several universal rules concerning formal golf attire exist. When preparing to play at a new course, always note the course's dress code before showing up. What might have been allowed at one course won't necessarily be acceptable at another course. If you have any doubt, dress more formally to ensure you fall within the guidelines. Wear a pair of golf shoes with soft spikes. Metal spikes are prohibited at most golf courses, and many courses require players to wear golf shoes instead of other footwear. Traditional, dress shoe-style golf shoes are always acceptable, but depending on the course, running shoes or sandals with cleats might be allowed. Choose between dress pants and dress shorts if you're male. If opting for dress pants, most courses allow any color, although sedate shades such as gray, black and tan always are appropriate. The pants should fit correctly and not have frayed cuffs. If you choose to wear shorts, they must be tailored and sit at or slightly above the knee. Some private clubs do not allow men to wear shorts, so ask before showing up in shorts. Always wear a belt with your pants or shorts. Select slacks, capris, shorts or a skirt if you're a female. Regardless of the option you choose, the garment must be of an acceptable length. Shorts or skirts should sit no more than 4 inches above your knee and should be tailored. Any color is appropriate, but the fabric must be dressy in nature rather than casual. Pick a shirt with a collar, regardless of your gender. For men, the shirt must always be collared and the sleeves must fall close to your elbows. Always keep the shirt tucked in. For women, collared shirts are acceptable, although sleeveless varieties are allowed at most courses. Depending on the style of the shirt, it might be acceptable to leave it untucked. Wear a hat, if desired, regardless of your gender. Baseball-style caps for males are acceptable. Always wear the cap with the brim pointing forward. Women may wear this same style of cap or a hat with a brim around the perimeter. Both men and women may also wear visors.